I recently moved my blog from WordPress.com to my current host. If you have experienced any problems with links. Please let me know. If you used to receive email notifications and you are no longer doing so, please resubmit your email. I’m very excited about attending my first SQL Pass Summit in Seattle in a few weeks. I haven’t even attended yet and I’m so impressed with the schedule, extracurricular events, and the mentors they assign first-timers like myself. One of the events they have schedule is on Wednesday. 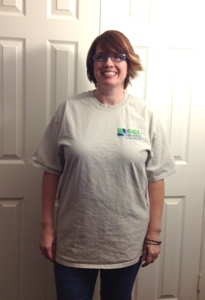 They want everyone to wear their SQL Saturday t-shirts. There is only one problem…..mine makes me look like a house. I absolutely refuse to where a men’s t-shirt that makes me look like that. So I tapped into the right side of my brain and pimped my t-shirt out. Now not only do I look like a girl, but a stylish one. Look out how happy I look. 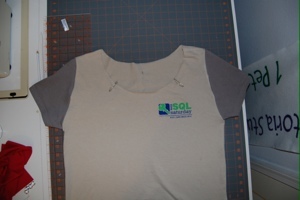 Now I look like a SQL girl. Growing up my grandmothers taught me crocheting and sewing. (My maternal grandmother taught me in Spanish. ) Now a days, I just go to Google or You-Tube and search for the technique I want to learn. 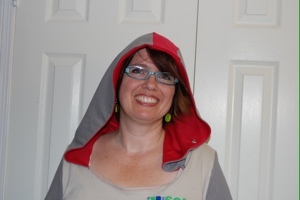 I found out how to alter a neckline and how to add a hoodie. Here are the steps I went through. How do you sew a hoodie? Here are the sites I found most helpful based on the sewing skills I already posses. If you have never sewn, I would suggest looking for some YouTube videos on the subject as well. 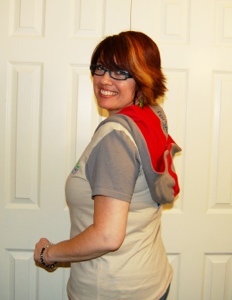 Shoulders – The shoulder seams needed to be moved up to my shoulders. I think this, out of all the issues with my t-shirt, made me look the boxiest. By moving the seams up to the edge of my shoulder where they belonged, I improved the look of my t-shirt immensely. 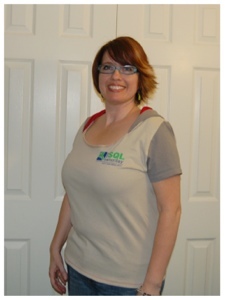 Sleeves – I’m only 5’6, so my sleeves needed to be shorter. Since I had an extra t-shirt that was in a contrasting color, I used it to change the color of my sleeves. Hoodie – Because I just needed it. Step 3. I marked up my t-shirt so that I knew where I needed to cut it. 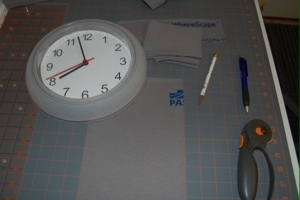 While the video tutorials talked about using scissors to cut the t-shirt up, I found using my rotary cutter much easier. I folded my t-shirt in half, making sure there were no wrinkles, then I cut the sides, arms, and neckline out. Since I folded the t-shirt in half, I knew my t-shirt would remain symmetric. great templates for cutting circles. Step 4. I created a pattern for the hoodie based on my favorite hoodie in my closet. I did buy some red t-shirt material for the hoodie, but I could have used another t-shirt. 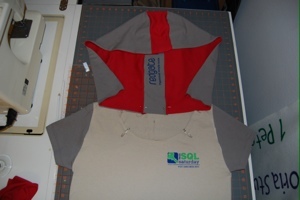 Since Red Gate is my absolute favorite toolset, I cut their logo out of a second t-shirt I had and put it in my hood. I used that same t-shirt for my sleeves and the rest of the hoodie. Step 5. I sewed the hoodie together. Step 6. I sewed the sides and the sleeves. Step 7. I attached the hoodie to the neckline. I did this by finding the center line of the back of the t-shirt, and the center line of the hoodie. 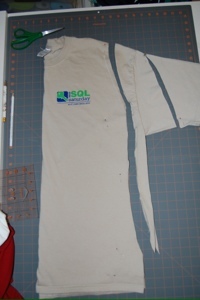 I started sewing from there so that I knew my t-shirt would be symmetric. since the hood will be down more than up, I have the seam facing out. Step 8. I used my twin needle and a contrasting color thread to sew the neckline. I used the same twin needle to sew the hem as well. When I taught beginning programming with Microsoft Visual Basic, I always used the traditional “Hello World!” to teach how to create a msgbox. Since this is my first Blog, I thought I would do the same. Share with the T-SQL community what I have learned over the years. Share with the BI community my knowledge with Microsoft SQL Reporting Services. Better myself as a writer.